Albert Einstein—universally considered a man of genius—is known for his revolutionary scientific ideas: relativity, an expanding universe, gravitational waves, etc. He is also known for his “God letter,” written in 1954 to a Jewish philosopher, where he writes, “the word God is for me nothing more than … human weakness, the Bible a collection of … legends which are nevertheless pretty childish.” The letter is (in)famous enough that it sold at Christie’s in 2018 for nearly $2.9 million dollars. I’m afraid the price of that letter is a sign of the post-WWII times, when many people had significant doubts in faith. Even today, Merriam Webster gives its first definition of “Faith” as “allegiance to duty or a person: loyalty.” A completely secular definition, probably a sign of our times. For my understanding, that would be a second or third definition, because my first definition is entirely spiritual: “Belief and trust in and loyalty to God.” I think my understanding and feelings of faith are a gift from my parents, who themselves exhibited faith in God. Because of faith, I sense that our lives are more than here-and-now: our lives are part of a continuous, divine existence. To express it, use whatever word or book you want…faith is a deep-seated sense of belonging to something divine. 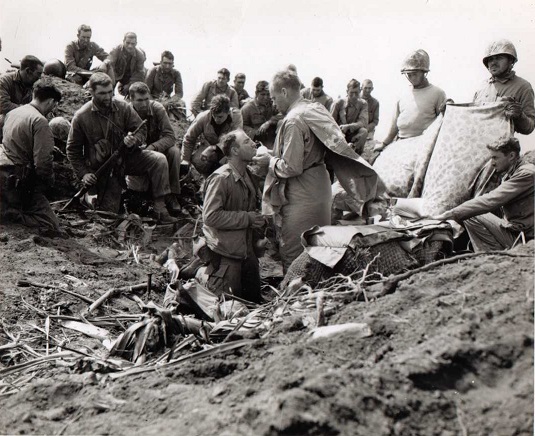 Reportedly Lt. Charles Suver saying Mass atop Mt. Suribachi during the invasion of Iwo Jima, February 23, 1945. While Einstein’s genius may have found the idea of God weak and childish, the Pawley family relied on their faith—their trust in God—to help them meet and overcome the fears and challenges of the war. It was a faith they shared, expressed, and relied on constantly.